It was a perfect winter morning, sun shining without the wind which was relentless for days. The temperature was near zero. 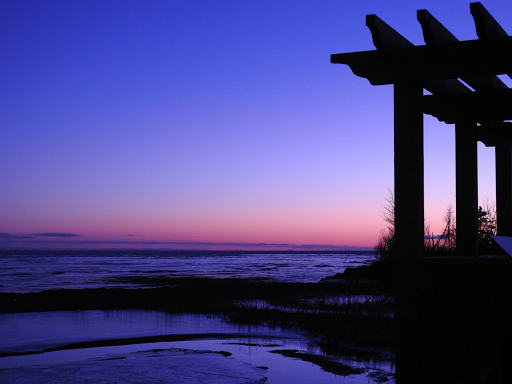 My husband has had problems with his camera and wanted to test it on our favourite part of the boardwalk. 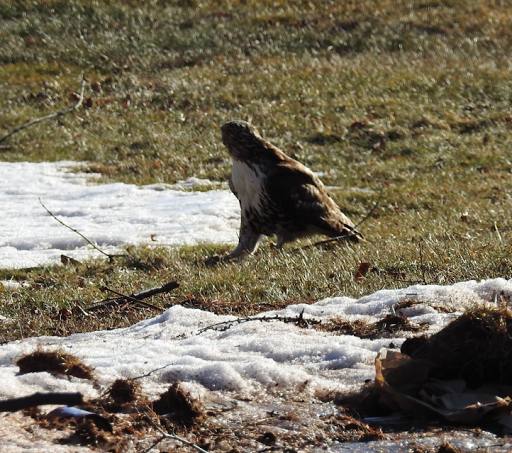 We parked the car and as we prepared to exit, there it was, a red-tailed hawk. 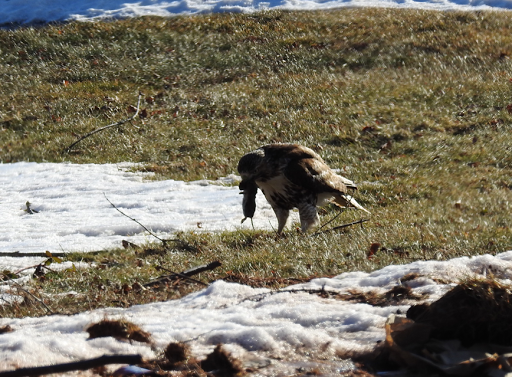 While they are common in the skies over fields as they hunt for rodents, we had never seen one up close. 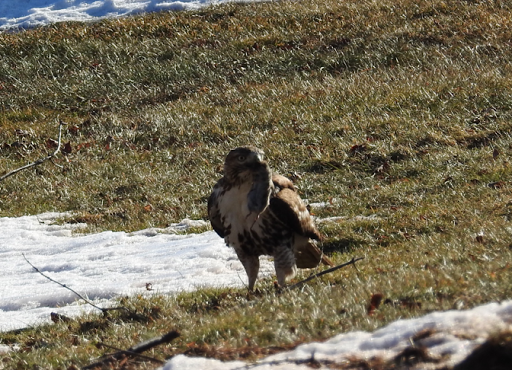 Such hawk splendor! 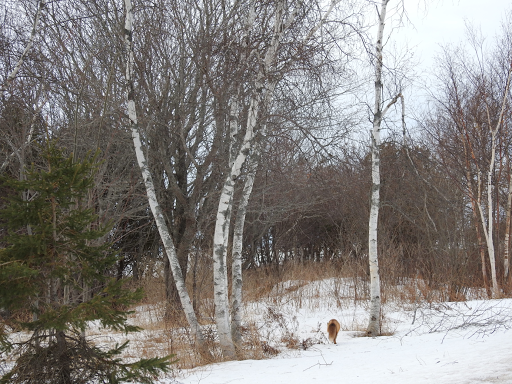 He was big, mottled, red brown and white. Then he turned his head. 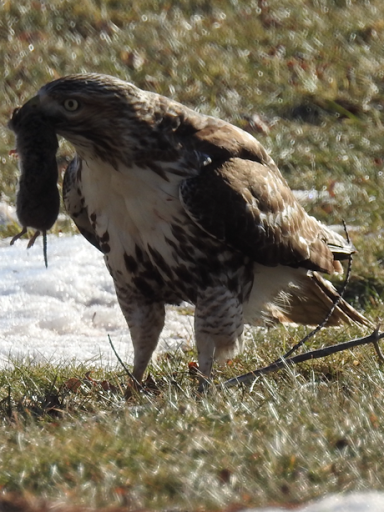 He had rodent for breakfast. We were glad it wasn't a squirrel. 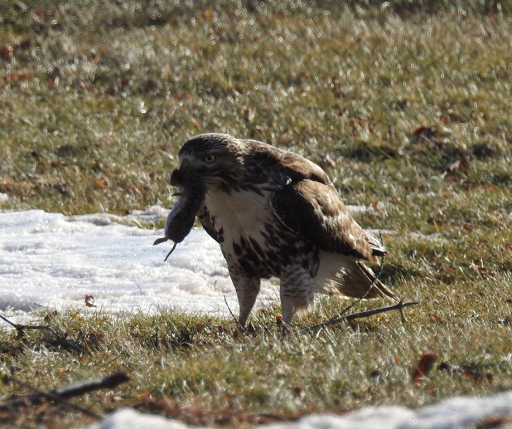 He was skillful in his handling of the food, using beak and talons. Eventually, he turned towards us. 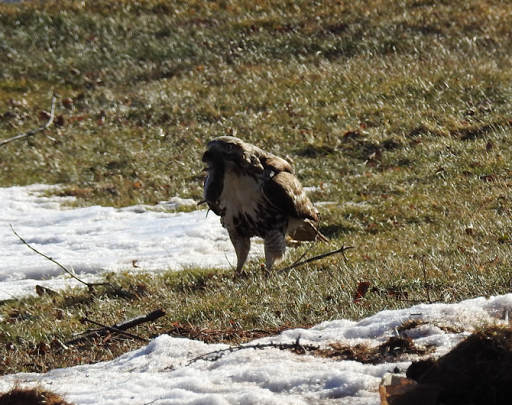 We could see that hawk eye, the beautiful white breast and the mottled legs. He had a firm grip on breakfast as he prepared to take flight. 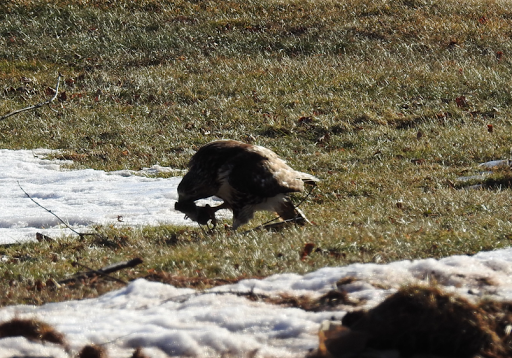 We missed the photo of the hawk in flight. He was too fast for us to follow. We were happy with what we did capture though, a once in a lifetime experience. The tools of the trade are frozen in the February snow. 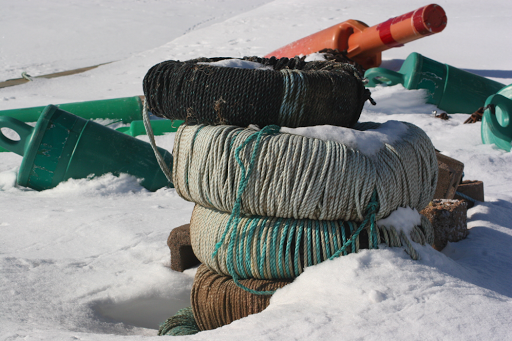 It will be a few months before the fishers reach for this gear in preparation for the lobster season. 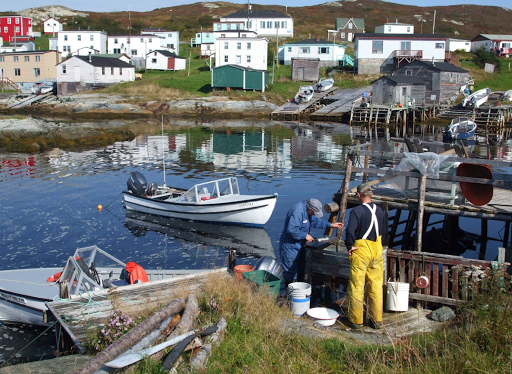 Meanwhile, the bits and pieces await the time when the sun is higher in the sky and activity increases around the fishing shacks. 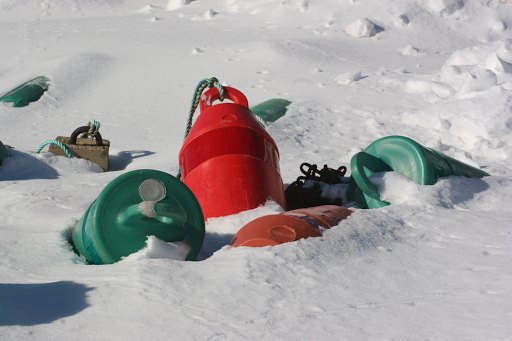 The gear is colourful against the snow which is melting around it today. It will take more than today to melt this snow however. Yet, it doesn't matter. This gear has withstood worse as it waits to be useful again. 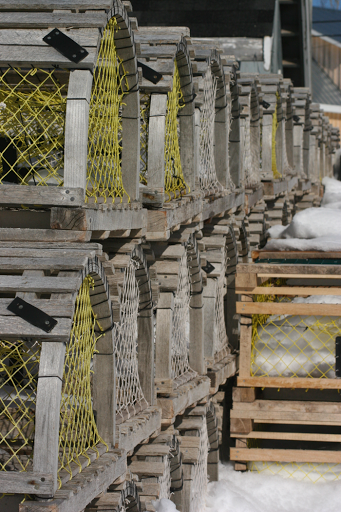 The lobster pots are weathered with that gray look wood attains when it has seen better days. Some call it character. Mesh fills in the spaces where unsuspecting lobster will be imprisioned. Rope gives the traps lines of colour. 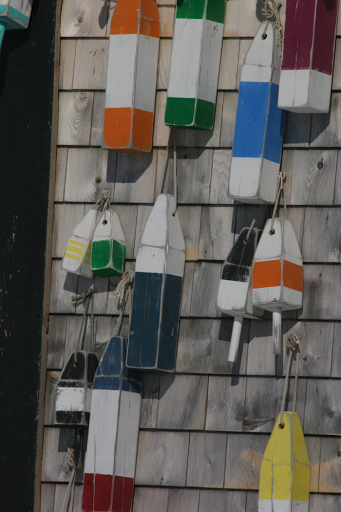 Construction of the buoys required time and effort in their day. 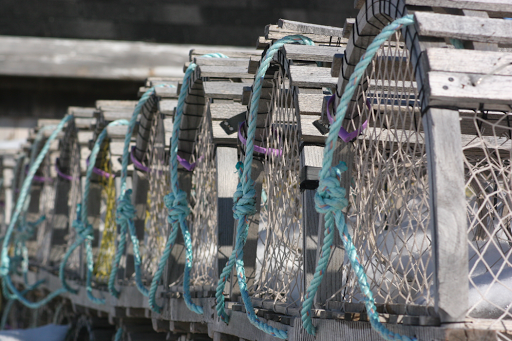 They were the traditional markers attached to the lobster traps set in the water. Each fisher had his own colour pattern which marked his traps. Today they are used as decorations. The traditional setting sits in anticipation as it holds the history of the people and their culture shrouded in the melting snow. Looking beyond the surface can lead to some interesting discoveries. 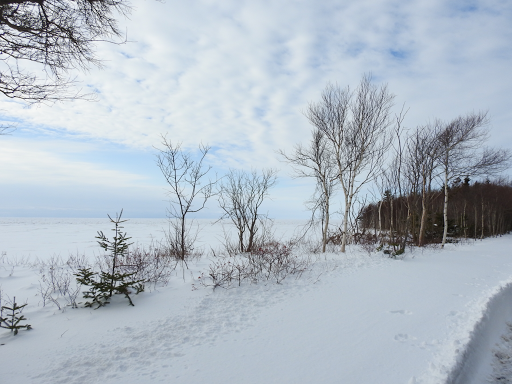 The latest snowfall created blurred lines between land and sea, making it difficult to distinguish where the shoreline ended and the ocean began. 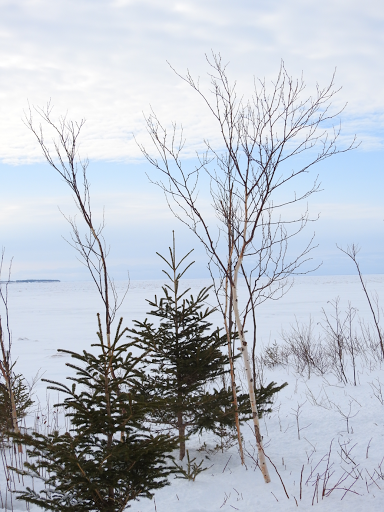 The land appeared to continue into the horizon, although sky blue provided some definition to the setting. The beach is a meter from the trees. There were human footprints on the bay. Animal tracks went down to the shoreline too. 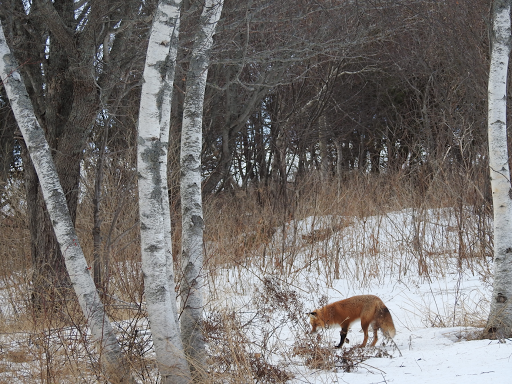 Another walker saw a fox on the ice, about fifty meters from shore. Blurred lines make land and sea available to everyone. 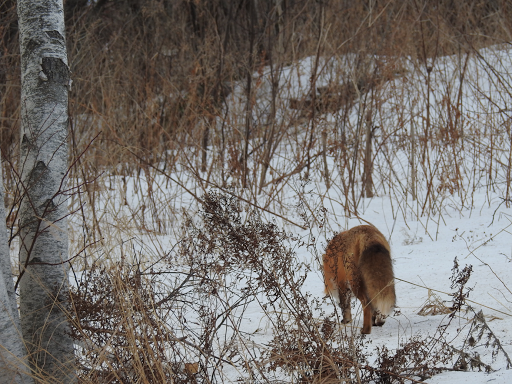 There is a den of foxes near our favourite part of the boardwalk. At sunset one day last year, we saw one as she stalked her prey. We wanted to see more. These animals are accustomed to humans and some people feed them. 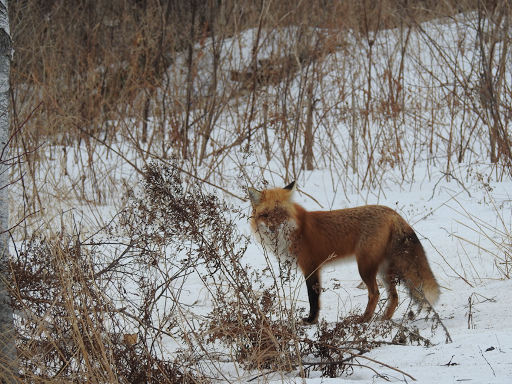 We would not feed the foxes. The area of the den, visible from the road wasn't active, so we walked our regular route. 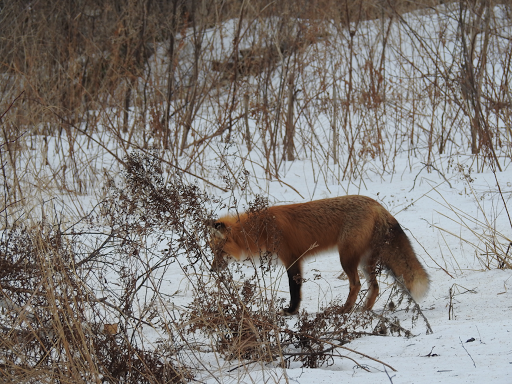 On our way home, we saw a fox on the opposite side of the road. When she crossed the road, I took some photos. 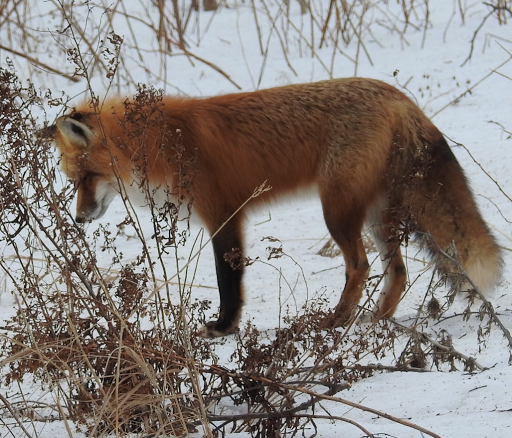 I thought this photo is all I would be able to take, until the fox saw something out of her left eye and stopped. Wish that old plant wasn't there. Then she looked my way. Her head was strawberry blond and her front legs were black. She was white from her mouth, under her neck, down her belly, the front of her back legs and at the tip of her tail. Foxy looked at something as if to pose. Then she was gone, but look at that tail! 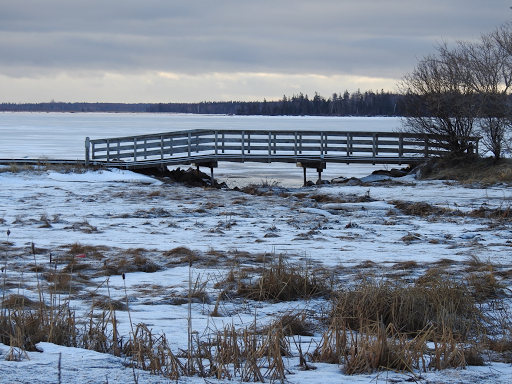 We watched the sun sink into the ice-covered sea then drove to the upper part of the boardwalk. 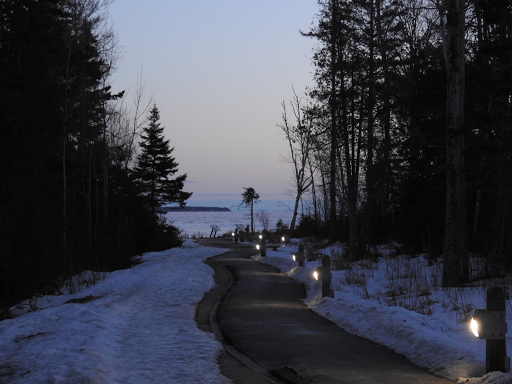 The lights along the trail lit the way as we walked the boardwalk for the first time at dusk. 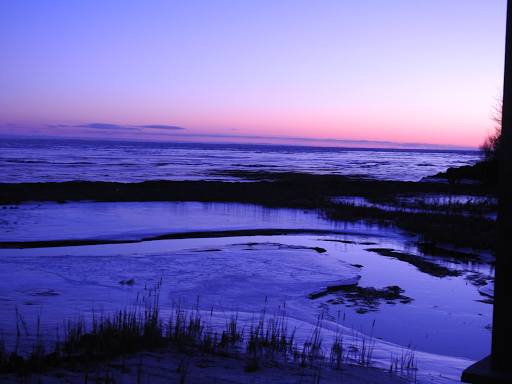 Light lingered on the horizon while deeper shades of blue spread over the bay. We were the only ones there. Even the animals had deserted the place, retreating to dens and nests for the evening. 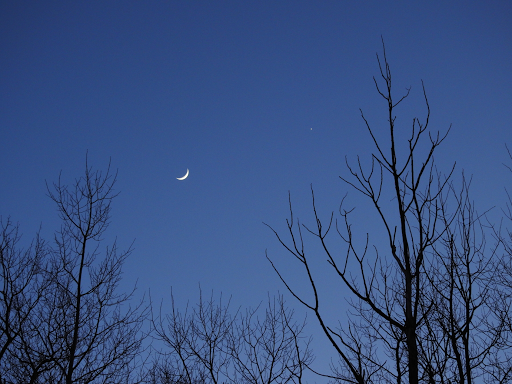 A sliver of moon was shining, accompanied by Venus. Silence added to the eerie feel of the place as darkness embraced the woods. Soon, the beauty of the setting made us forget all else. Then it started, howling, but different from that of dogs. A lonely sound, it carried in the still, otherwise silent evening air. Foxes! They howled as if to say, "We are here." By the time I was ready to record them, they had fallen silent. Howling sounds on this short clip are similar to those we heard. 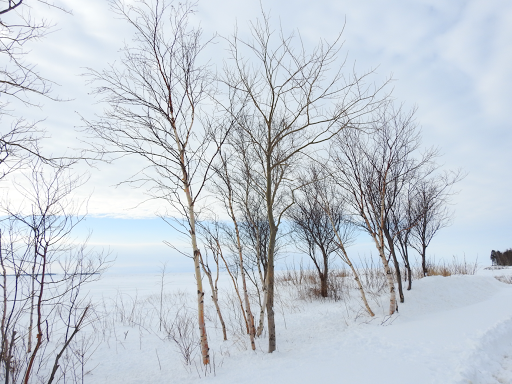 The white trunks of the birches looked to have been created for this place and time. The lights of the city twinkled in the background. 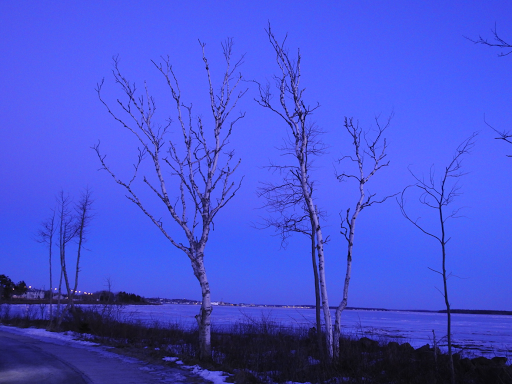 Other trees looked black against the blue sky. 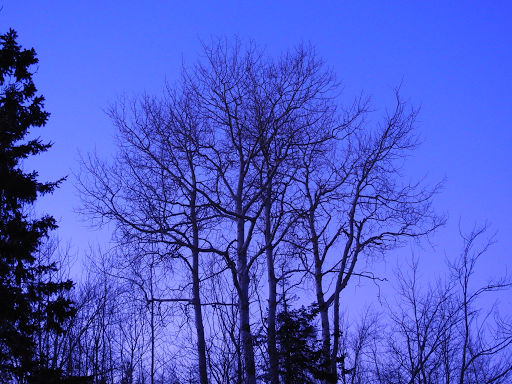 The intricate branchlets of one tree reached for the sky like tendrils grasping for the ether. the flash of the lighthouse was obvious as it beamed in rotation. For a few moments in time, all was right with the world. 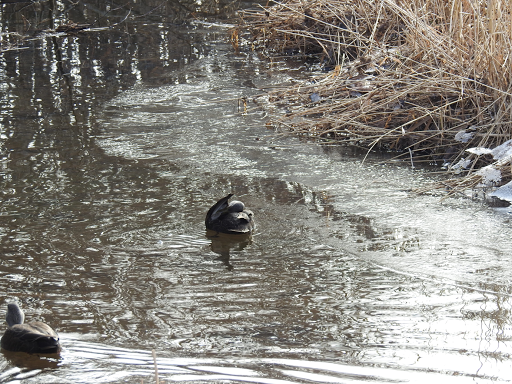 It was a pleasant surprise to see two American black ducks busy in the river by the boardwalk during a recent visit. They were absent for months. Part of the river was in the shade and it was difficult to see the ducks on the black water. My husband and I watched them for a time and they came into the light long enough for us to take some photos. 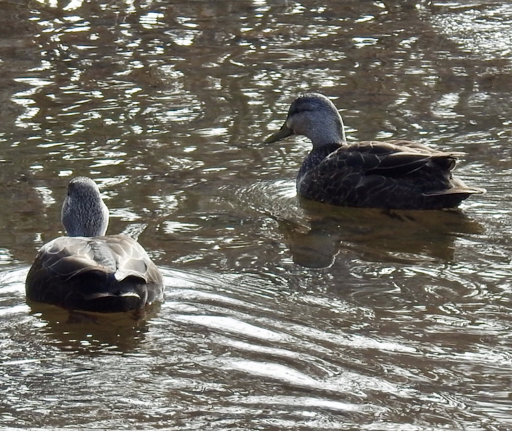 These are dabbling ducks. They do not dive but rather dip their heads underwater in a "bottoms up" motion to feed near or on the surface. 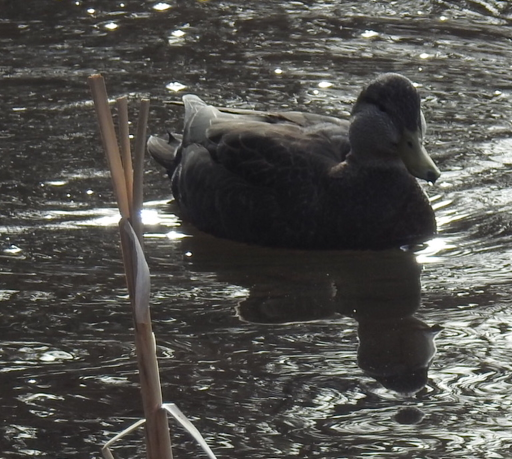 They are also know as puddle ducks, frequenting rivers and marshes rather than large bodies of water. We were not as successful taking a photo of the beaver who shared the river with the ducks. There were beavers in this area early last year but the city moved them. They dammed a stream which flows into the river and cut many trees from the greenbelt in the process. 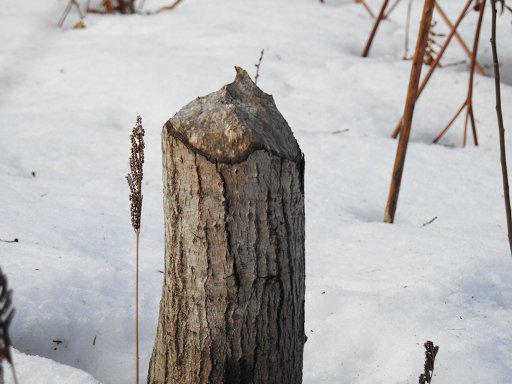 Beavers have powerful jaws and teeth as testified by the stump which remains along the trail. There is at least one beaver here again. The beaver swam with its head just above the surface of the water but dived often, making it hard to find it again when it re-surfaced. I enjoy seeing beavers in the area, though I imagine it will be a short stay. The variety of wildlife makes the boardwalk such a lovely place for a walk. 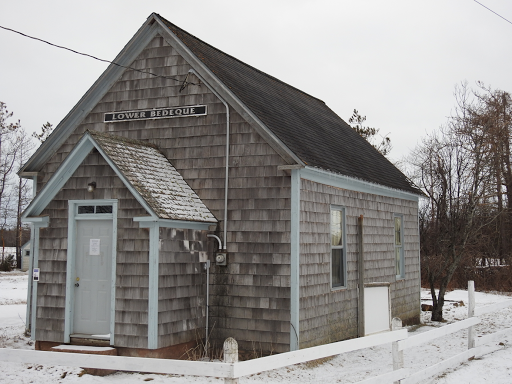 This little school house stands against the elements in Lower Bedeque, Prince Edward Island. On this cold winter day, with the wind attempting to freeze our brains, it is hard to imagine the time when this school opened in 1886. We think about the children walking to school from the area farms, or horse and cart pulling up to drop off neighbourhood children. The little one room school opened its doors to all ages as was common at the time. Lucy Maud Montgomery, an island author, taught in this school in 1897 for six months. She left to care for her grandmother after her grandfather died. Lucy Maud never taught again. However, it was an interesting time in her life. 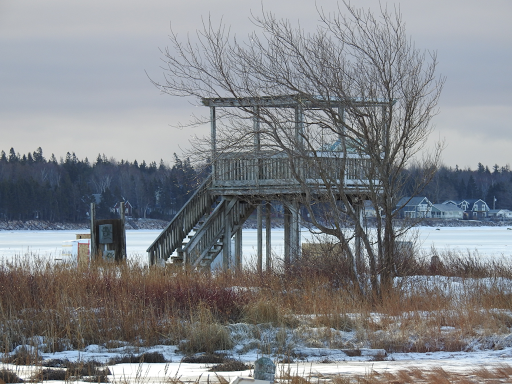 Lucy Maud was engaged when she moved to Lower Bedeque. During her time there, she met a man described as "the love of her life." Herman Leard was one of two sons of the family where she boarded, near the school. Nothing came of the relationship; Lucy Maud left and Herman died the next year. As my husband and I observed the little school this day, we talked of the school where he taught in 1975-76. His post was in Grand Bruit, Newfoundland, an isolated community on the island's south coast, only accessible by coastal boat. He taught everything from Kindergarten to Grade 8 to nine children in the community. The children left home to do high school further along the coast, in a community connected by road to the rest of the island. 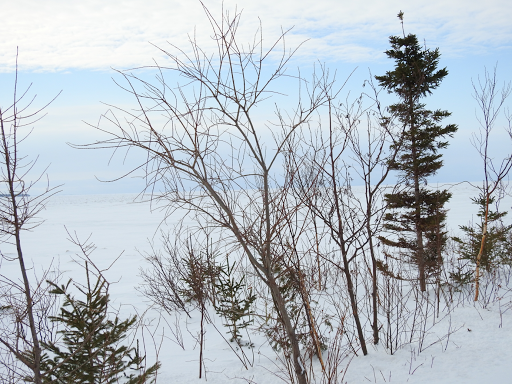 Today Grand Bruit is abandoned and the people resettled elsewhere in Newfoundland. We were engaged during that year as he worked in his sole charge school. The next year he was offered a job in the school where I worked and we were married. The rest is our family history. 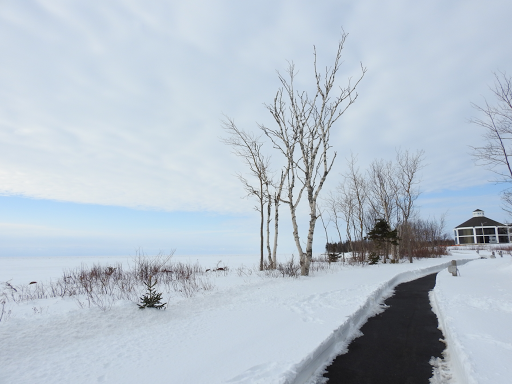 On this cold winter day, a little school in Prince Edward Island stirred up warm memories of young love which has matured and grown with time. Happy Valentine's Day to you and your special one! It was our first visit to Seacow Head lighthouse. 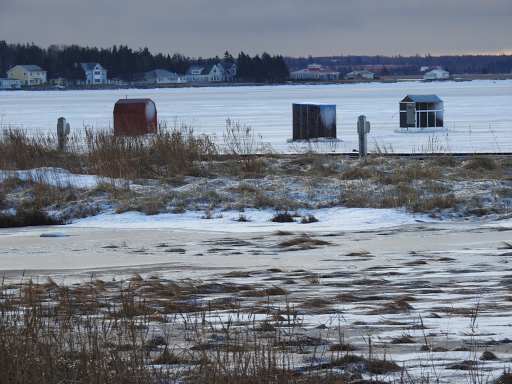 The area, about twenty minutes from Summerside, Prince Edward Island, is cottage country. 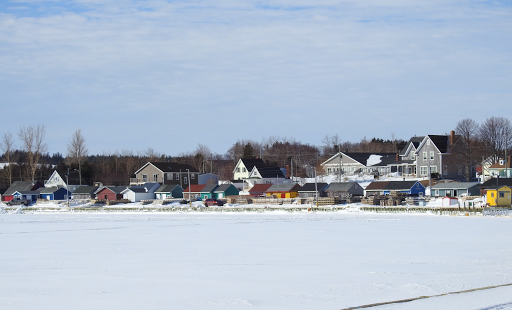 At this time of year, the cottages stand empty against the worst weather conditions. This year though, has been unusual so far. While the winds have wreaked havoc on trees and roofs, the snow has stayed away with the exception of a few days earlier in the season. Now, little remains. 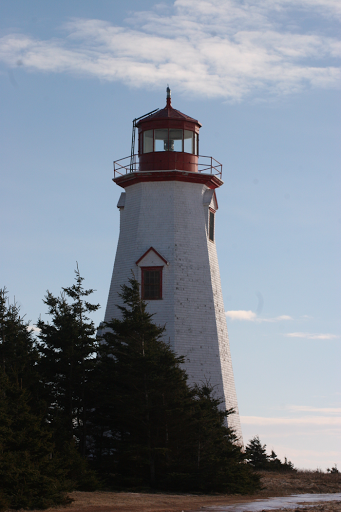 My husband and I could drive up to the lighthouse, a rare mid-winter experience. This lighthouse stands on a headland of sandstone cliffs. 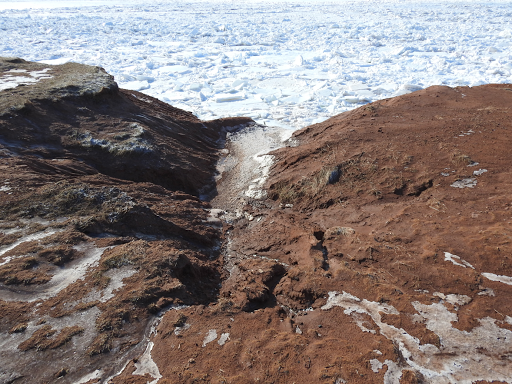 Here, the sandstone along the shore is covered in red soil which washes away easily. 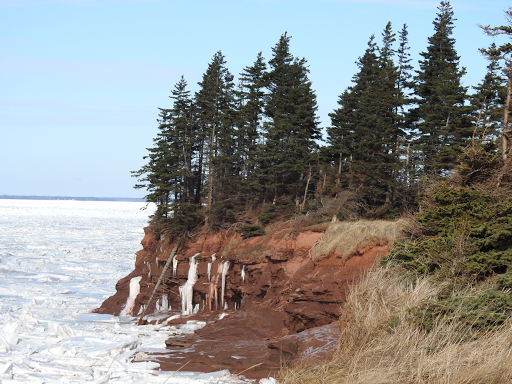 You can see the vegetation hanging over the side of the the cliffs as soil disappears faster than the sandstone below. 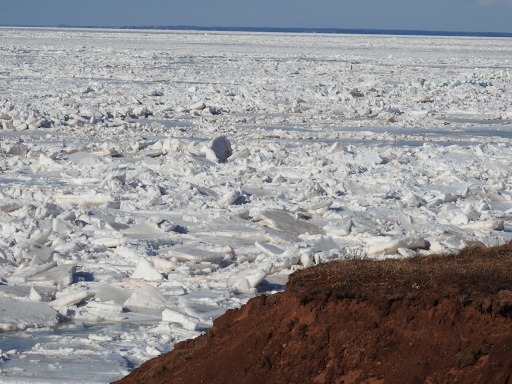 The ice in the Northumberland Strait extends to New Brunswick on the mainland, visible in the distance. On closer inspection, one realizes there are small areas of open water. 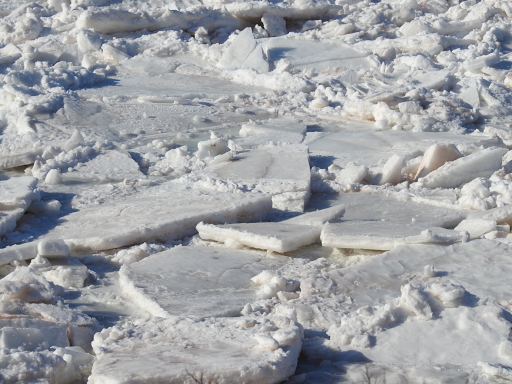 Along the shoreline, the ice piles up with the on-shore wind and the tide. 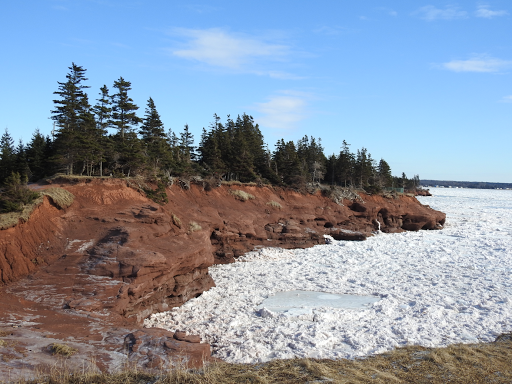 The red cliffs are in stark contrast to the ice, but water has frozen in transit down the rock, as if attempting to link land and sea. 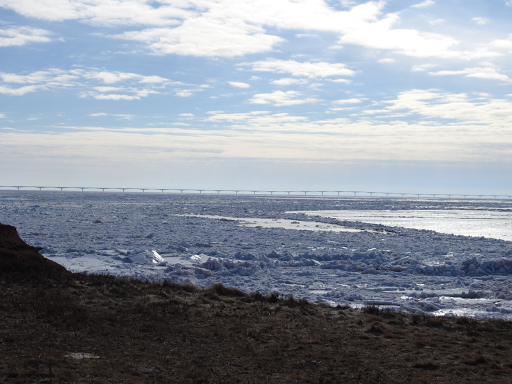 The Confederation Bridge is visible in the distance. It is the world's longest bridge over ice-covered water. 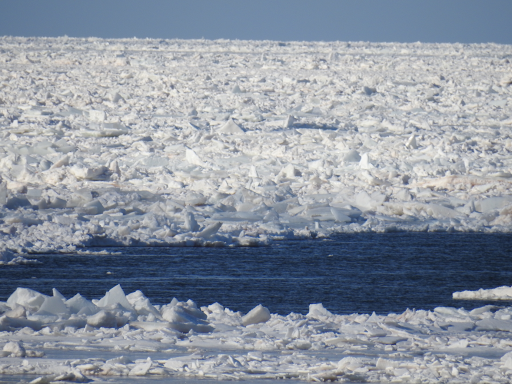 People and nature have worked their magic and today, the bridge looks like part of an ice field. 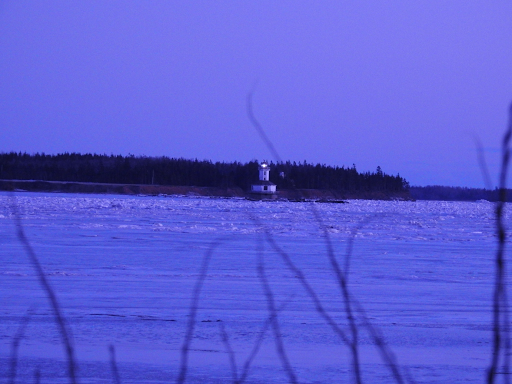 High winds do not test the lighthouse today so the cold is bearable. The lighthouse and the land are named after walrus which lived in these waters at one time. The structure was built in 1864 but was moved from its original site in 1979 due to the effects of erosion. Today, gullies into the shoreline show that effect. 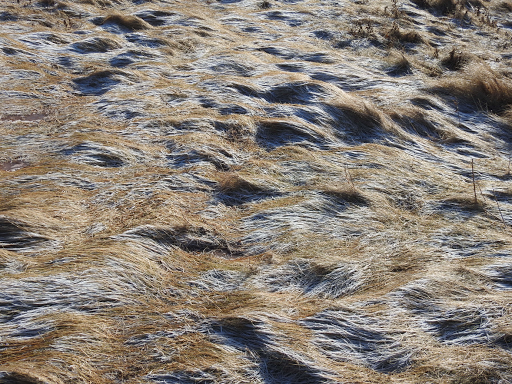 The long grass on the headland looks like waves of blond-gray frosted hair. 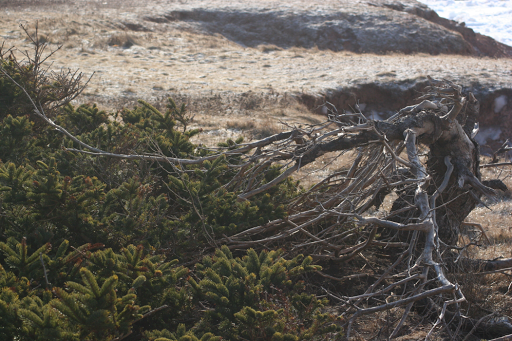 A tree near the edge of the shoreline has experienced severe conditions if the trunk is any indication. 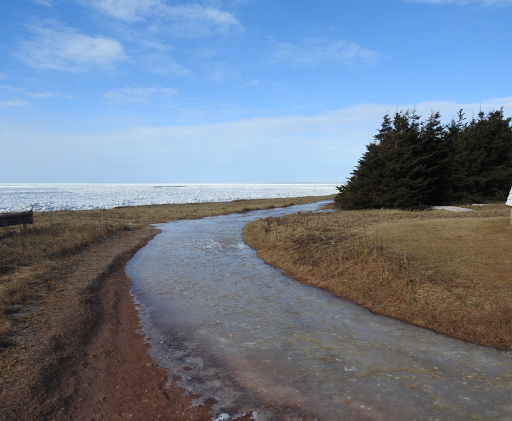 Nearby, the road around the lighthouse is like a skating rink. The weather sculpts this place. We look forward to its artistry next season. One day last week, after numerous gray days and bad weather, the sun made an appearance. The northern sky cleared and attempted to clear to the south. 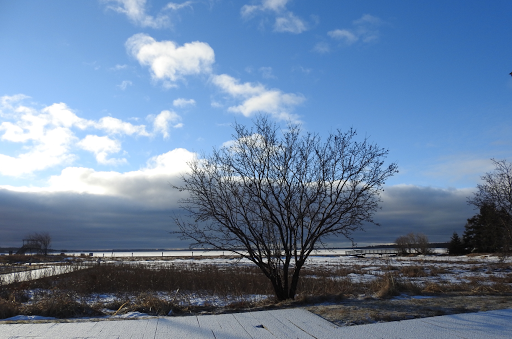 However, a menacing cloud bank held its place and the sun was short-lived. 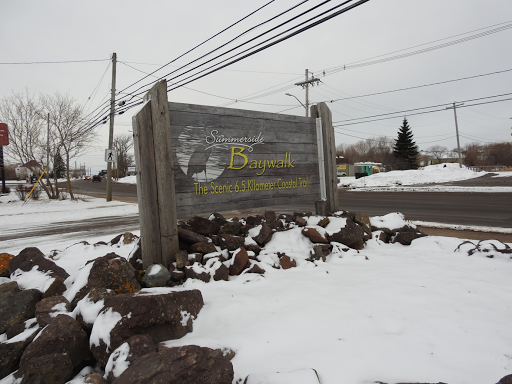 We wanted to explore the beginning of the boardwalk in Summerside. Our walks have always been along the upper part of the Baywalk but curiosity and the desire for a change of scene drew us to the inner part of the bay. We didn't get far. Snow-covered ice, not yet salted since the freezing rain storm the previous day, prevented us from walking on the trail. Nevertheless, I took some of my favourite photos with my new camera. 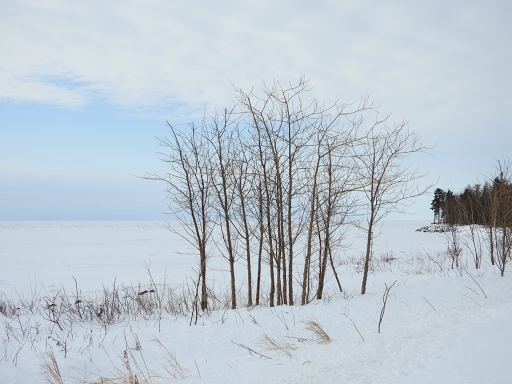 This single tree is all its winter splendor was highlighted against the sky, ice covered bay, the boardwalk and marsh. There is a small abandoned bird's nest in the tree as well. not brilliant sunshine but muted light for mid morning, the scene almost aglow.